The Block House has stood in its same location for nearly 250 years - a witness to Pittsburgh's history as a frontier fort, large industrial center and leading modern city. Gifted to the Fort Pitt Society of the Daughters of the American Revolution in 1894, it has remained free and open to visitors for over a century. Located in the heart of Point State Park in Downtown Pittsburgh, the Fort Pitt Block House is open year-round with free admission to visitors and tour groups of all ages. Its history is interpreted through on-site educators, period artifacts, digital presentations, and exhibits. Click here for more information on our hours of operation, arranging specialized tours, and directions to the Block House. This year, 2014, marks the 250th anniversary of the construction of the Fort Pitt Block House in 1764. The Fort Pitt Society has planned a year-long, city-wide celebration to recognize this significant milestone. "The Block House is quite literally where Pittsburgh began," says Joanne Ostergaard, Coordinator of Block House 250. For more information on Block House 250 and upcoming events, click here. Check for instant updates and news on our Facebook Page. Throughout 2013, the Fort Pitt Society conducted a 10-month preservation and restoration project at the Block House. The project, funded with gifts from an anonymous donor and the Colcom Foundation, provided much needed repair and restoration work to preserve and protect the structure for the future. Click here for more about this fascinating project. Photos from the project are available on our Facebook Page. News articles and television interviews are archived on our News page. The Fort Pitt Society of the Daughters of the American Revolution of Allegheny County was incorporated in 1892 in order to accept the donation of the Fort Pitt Block House from Mary Schenley. 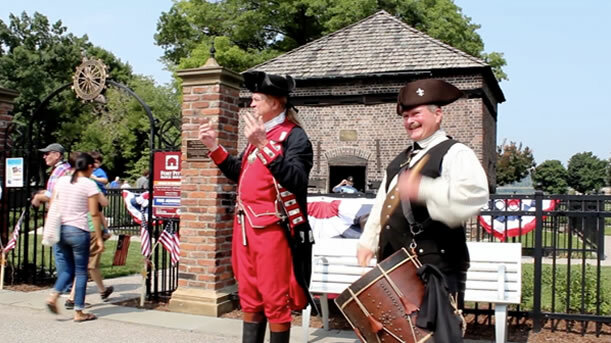 Watch this video to learn more about the Fort Pitt Block House and how the members of the Fort Pitt Society have worked for more than 120 years to preserve and protect this valuable historic landmark, keeping it open and free to the public. Want to learn more about the Block House? Read our new book, the first comprehensive history ever compiled of Pittsburgh's oldest architectural landmark. Published in October 2013 by The History Press of Charleston, SC, The Fort Pitt Block House will enlighten readers on how and why the building was constructed as well as its amazing story of survival over the last 250 years. Written by former site curator Emily M. Weaver, it is available for purchase. Click here for more information. The Fort Pitt Block House celebrates its 250th anniversary this year, 2014. As owners and stewards of Pittsburgh’s oldest authenticated structure, the Fort Pitt Society have planned a year-long, city-wide celebration for the Block House in recognition of this significant milestone. Many activities and events will be held throughout 2014 to highlight the significance of the Block House in early Pittsburgh and American history and to celebrate the remarkable women who have worked tirelessly for more than 100 years to preserve and protect this historical treasure. For more information on Block House 250 click here. Visit today! Learn more about the Block House and its amazing history. Make a gift. Help ensure that the Block House remains for future generations to know and appreciate Pittsburgh’s earliest history by making a financial contribution. Purchase a souvenir and support the Block House! We have many souvenirs available, including limited edition Block House 250 commemorative brass coins. Consider giving Block House souvenirs as gifts during the holiday season. Share your experience – write a review of your visit to the Block House on Greatnonprofits.com or on TripAdvisor.com. Like us on Facebook, learn more about upcoming events and activities. Plan Your Next Class Field Trip Today! Watch this video to preview what you will see and learn on your field trip to the Fort Pitt Block House. Every year the Fort Pitt Block House makes history come alive for thousands of local school children. Educational tours can be conducted for school groups ranging from second grade to graduate school. 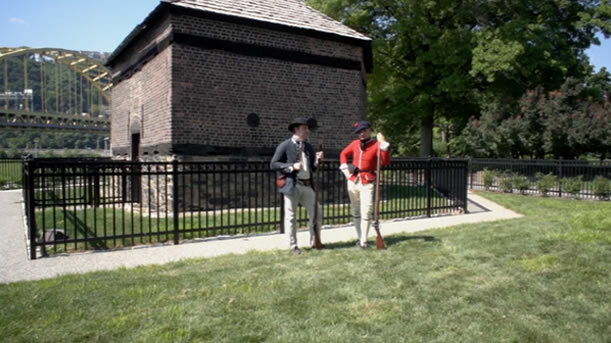 Students learn how the Block House was originally used as a defensive redoubt by standing on a reconstructed firing step and taking aim through the building’s gun loops. Guided tours of the site are tailored to the audience and offered by expert staff and knowledgeable volunteers. Small yet fact-filled exhibits are featured throughout the building, adding to the experience and taking visitors back in time in this one-of-a-kind historical landmark. To schedule a tour or for more information, please call (412) 471-1764 or send an email by using the Contact Us page on this website. Hours of operation and directions to the Block House can be found here. Other nearby attractions include the Fort Pitt Museum and Point State Park. Tours of the Block House can easily be arranged to include tours of the museum and/or the park. Ask about these options when scheduling your field trip today! As our 250th anniversary draws to a close we have much to be grateful for at the Fort Pitt Block House. A record-shattering 54,000 visitors have filled the historic structure so far this year, joining in the Block House 250 celebrations. Support from the community has helped to make this year an incredible success! Although our 250th anniversary is ending, the need to sustain the Block House for future generations is only growing stronger. It is crucial that the Block House remain in sound condition, open to the public and free of charge, presenting Pittsburgh history for all to enjoy. As a privately owned historic landmark, the Fort Pitt Block House receives no state or federal funding. Your support is needed more than ever. Please, help us keep history alive. During this season of giving, please support the Fort Pitt Block House with your tax deductible gift. Donate online today or mail your contribution to 601 Commonwealth Place, Building C, Pittsburgh, PA 15222. Watch this video to learn more about the Fort Pitt Block House – a witness to Pittsburgh’s history as a frontier fort, large industrial center and now, leading modern city. Gifted to the Fort Pitt Society of the Daughters of the American Revolution in 1894, it has remained free and open to visitors as a historic site for over a century.